We’ve added this year’s UCAS parents’ guide to our download area. This guide is intended for anyone supporting a young person applying to study at university or college in 2017, and covers the key stages of the UCAS Undergraduate application process. 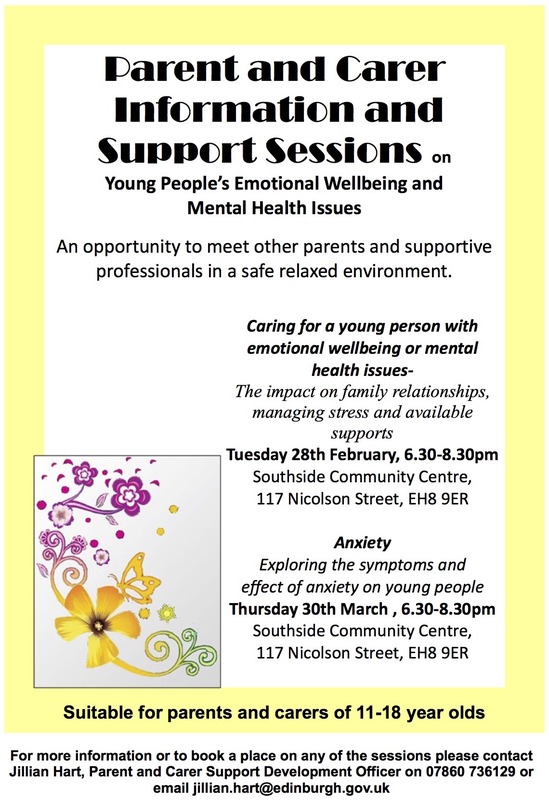 The Children and Families department of Edinburgh Council are organising a series of support sessions for parents and carers who wish more information or are concerned about their pre-teen or teenager’s emotional wellbeing and mental health. Each monthly session has a different topic focus. There is also an opportunity for parents and carers to meet other parents and supportive professionals in a safe relaxed environment. Caring for a Young Person with Emotional Wellbeing and Mental Health Issues. This session, facilitated by VOCAL, will explore the impact of caring for a young person with emotional wellbeing and mental health issues on family relationships. We will also cover stress management and available supports. Anxiety – Exploring the symptoms and effects of anxiety on young people. If you would like to attend please email Jillian Hart at the Parent & Carer Support, Children and Families. Newhaven Heritage community group have prepared a leaflet to seek feedback and support to retain Victoria for either educational or community use. Victoria is the oldest working school in Edinburgh and has served the village of Newhaven since 1844. If you want to support this or shares your views on the future use of the school, please let respond to them by completing the feedback section of the leaflet that’s available in our download area. You can post your response in the Save The School For Newhaven boxes at the school office or local shops. The City of Edinburgh Council is also seeking views on this proposal and there is an online survey available to respond to them directly. The Council is holding a statutory consultation on a proposal to relocate Victoria Primary School to a new building in the Western Harbour area and undertake catchment changes in the Western Harbour and North Leith areas of the city. The public consultation period will run until 5pm on Friday 17 March. The Council has a legal obligation to carry out a statutory consultation under the Schools (Consultation) (Scotland) Act 2010 as amended by the Children and Young People (Scotland) Act 2014. The proposal put forward will have implications for families at Trinity Academy and they want to hear the views of anyone affected. Parents at Trinity Academy have been advised of the consultation because of the proposed changes that will add Western Harbour to the school’s catchment area. Traditionally Victoria Primary’s roll has been drawn from housing to the south and west of the school and sections of the Western Harbour area are currently not contained within any catchment area. The primary pupil population in the Western Harbour has increased by 500% between 2009 and 2015; some of those students are now in P6 and many will soon be welcomed to Trinity Academy as their neighbourhood secondary school. The Parent Council will be discussing this consultation at our next meeting and and we welcome your views on the changes. What are the implications for Trinity Academy? The Council report highlights that all of our cluster primary schools (Trinity, Wardie and Victoria) have faced “accommodation pressures” in the last few years, exacerbated by the closure of Fort Primary in 2010. Each of our feeder primaries has had extensions added to cope with this growth in school rolls and some of these children will soon be moving to secondary school — many of them to Trinity Academy. in the last 6 years the cluster primaries have seen their rolls rise by by as much as 70%. The new Victoria Primary School is proposed to allow that school to cope with increasing numbers. Trinity Primary has had four classrooms added and plans are in place to add a further extension in August 2018. As a Parent Council we wish to ensure that the Council has a strategy in place to cope with increasing intakes to Trinity Academy given the majority of children at Trinity, Wardie and Victoria primaries will move to the Academy. Trinity Academy currently faces pressures coping with it’s current roll with regard to general purpose space and PE provision. We want to ensure that when we welcome increasing numbers of students to the school they are provided with the appropriate environment. This consultation provides parents at Trinity Academy with an opportunity to comment on the proposed change to the Trinity Academy catchment and to highlight any concerns about the impact of rising school rolls in the area and request that the Council consider a strategy for the secondary school estate in addition to primary schools. To give the council your views visit the consultation website or email new.victoriaschool@edinburgh.gov.uk. If you wish to share those views with the Parent Council send an email to trinityparentcouncil@googlemail.com. 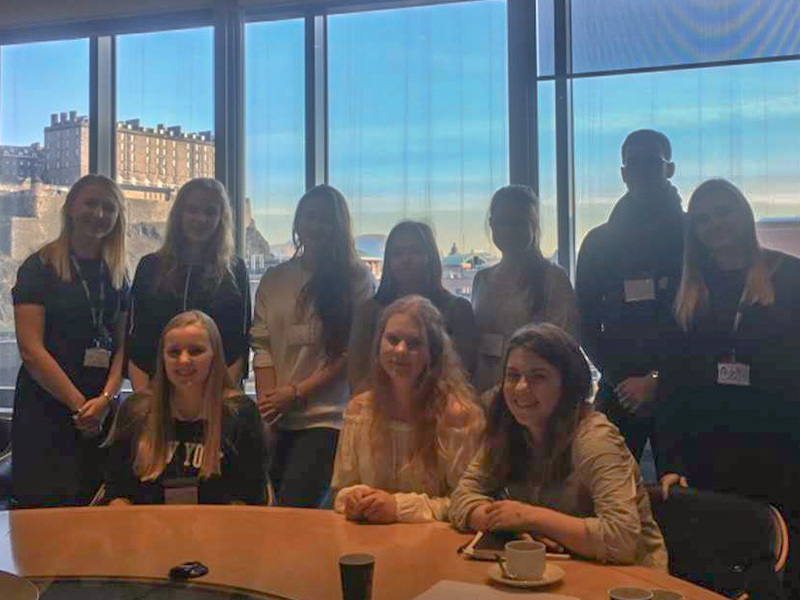 This week, young employees from the Young Persons’ Development Network (or YPDN) at Standard Life welcomed eight Erasmus pupils from Trinity Academy, delivering a half-day session on who Standard Life are, what they do, and what it’s like to be a young person working there. The students came from Germany, Holland, Norway, Sweden and Scotland, and were visiting various multinational companies to obtain material they could use in mock job fairs in their home countries. The day involved presentations that focused on Standard Life’s commitment to young people in the work force and they had the chance to undertake an assessment day team challenge, Boardroom Chaos! 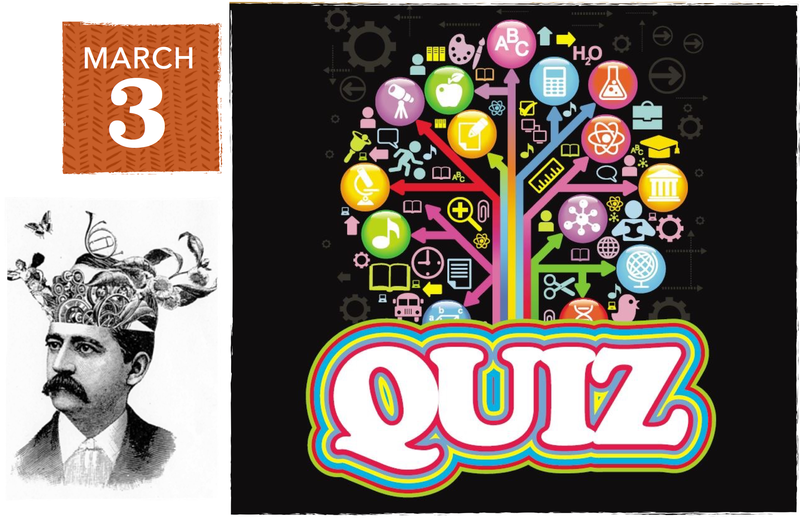 The Annual Quiz Night will be held on Friday 3rd March at 7pmTickets cost just £5 and £2.50 for kids. Or have a Family team and see if you can beat your neighbours. Author and musician Daniel Rachel will give a talk and play some music at the school to accompany his book Isle of Noises that features exclusive, in-depth, conversations with twenty-seven of the UK’s greatest living musicians. 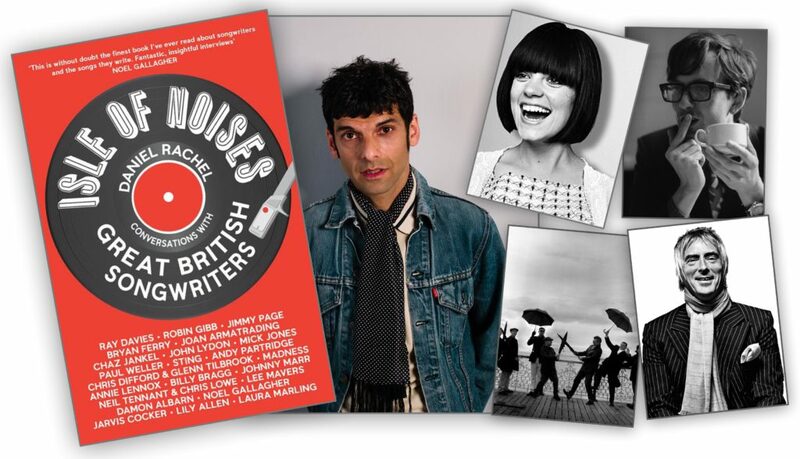 Anyone, who loves music, will enjoy this opportunity to hear about the art and craft of songwriting by creators of some absolute classics. We’re grateful to Daniel for adding an event at the school and all funds raised for the evening will go towards the costs of the new sound and lighting equipment for the school. This is a perfect match as the new equipment will benefit all the musicians and concerts at the school. Tickets costs £10 (concessions £7.50) and you can book online through Brown Paper Tickets where you will also find further event information. You may also reserve a ticket by emailing Mike Nicholson. The SQA has published guidance on the future changes to assessment of National 5 courses on their website. The changes follow an announcement by the Deputy First Minister (DFM) in September that he wanted to reduce workload for pupils and teachers by removing units and unit assessment from the National courses.